I am eleven days away from my next race and I'm looking forward to the event. This upcoming race is different from any I've raced before, including my previous trail race, the Dirty Sock 10K. The March 7th XTERRA race at Stillwell Woods presents conditions that will challenge runners at every step. Unlike a road race where the streets are wide enough for bunches of runners, Stillwell has a lot of singletrack paths that barely accommodate one person. I don't know exactly how the course will be routed but there are some significant drops and climbs in those woods. On the bright side, if I am able to keep up with the other runners I may have my first experience running at Stillwell without getting lost. I haven't been able to train on trails since my adventure at Muttontown Preserve a few weeks ago. Since then there's been too much snow and more coming this weekend if predictions for a Nor'easter are accurate. I've been relegated to the treadmill except on days off so I'm under-trained for hills. I ran 2.4 miles this morning at 9:17/mile. The guest room was warm and I wore my Atayne shirt that I love but it's slightly heavier than my other short sleeved running shirts. Together they contributed to a sweaty but pleasant run. I had the TV on so I could catch some highlights from last night's Olympic games while I ran. I'm hoping that I can get outside this weekend for some hill training or do some elliptical sessions at a high resistance level. Otherwise I'll just need to manage my way through the race with my present state of conditioning. I'm also wondering what the Stillwell course will be like if there's a ton of snow on the ground. 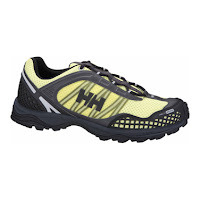 I'll be wearing my Helly Hansen Trail Lizards, my most capable trail runners. I'm hoping they'll be enough shoe for the day's conditions.